New for 2019 The onesie is a welcomed inclusion into any range. YKK zipper front opening. Slim fit elasticated 1x1 rib cuffs. 2-piece hood, with single jersey lining. Kangaroo patch pocket with flatlock stitching. Flatlock stitching around armholes. Taped back neck. 40 Cotton. Do not bleach. Do not tumble dry. 2 dot iron. Do not dry clean. Wash at 40 degrees. Wash dark colours separately. Do not iron directly onto motif If decorated. Keep away from fire. 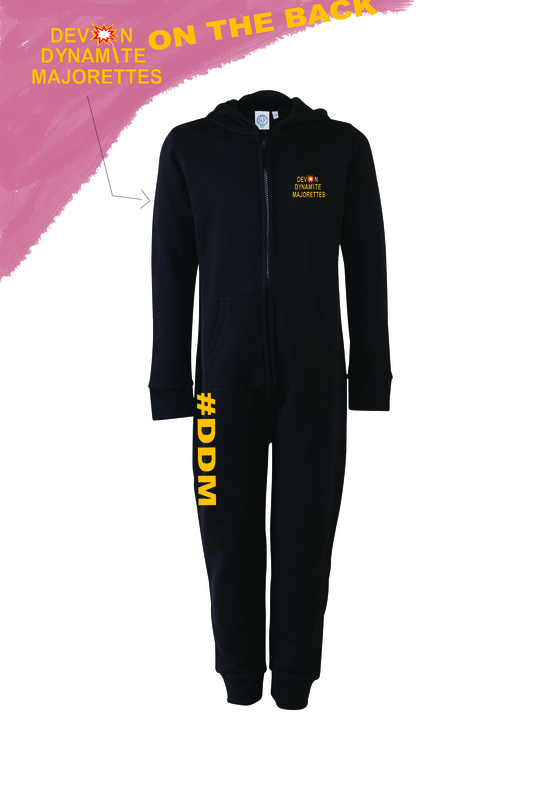 Comes with embroidered front logo large back print and #DDM on the leg. Size 3/4 22" 5/6 24" 7/8 26" 9/11 28" 11/12 30.5" 13 33"
Size XXS/XS 32/36" S/M 36/40" L/XL 42/46"